The U.S. Department of Education has debuted a mobile app for students applying for federal financial aid. This beta version of the "myStudentAid" app can be downloaded from the Apple App Store and Google Play Store. Development of the new release was done in parallel with a redesign of the FAFSA.gov website. The goal for both: to make it easier for students and families to fill out the 2018-2019 Free Application for Federal Student Aid. However, the beta version of myFAFSA doesn't include all of the same features as FAFSA.gov. An enhanced version of the app is expected to be released in October and will include additional functionality. Access FSA's signature source of information on student financial aid products, processes and services. A few anomalies exist in the beta version of the software for the 2017-2018 FAFSA form: According to reporting by the Washington Post, the IRS Data Retrieval Tool doesn't work yet; nor can the app be used to correct a previously-filed FAFSA or renew an application. Those activities have to be handled through the redesigned website. 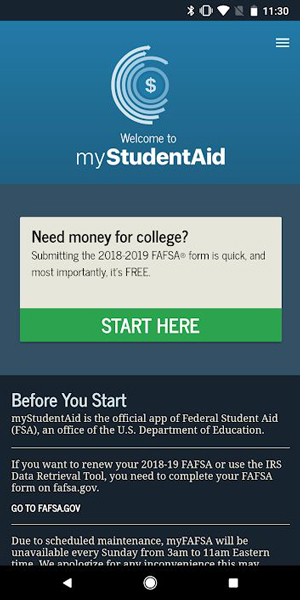 That new website will now resize to fit on mobile devices, making it easier for people to fill out the FAFSA form using smartphones and tablets. Also, some user-friendly features have been introduced. For instance, "Help and Hints" boxes now say "Tool tips" and include contextual information for each question. And the questions themselves are now regrouped to require fewer pages. "Students should be able to complete their FAFSA easily on their phones and in one sitting. They should receive expert, tailored advice about their options. It's called 'student aid,' after all. And throughout the life of their loans, students should be able to communicate directly — by texting or chatting or whatever the most current method is — with professionals whose primary duty is to them," Secretary Betsy DeVos told financial aid professionals in a speech last November, when she first announced the app. "We will make the financial aid process modern, streamlined, more accessible and simply easier for students — and you." "Easy" is a relative term. Students and families will still need to answer a long string of questions on student and parent demographic information, school selection, dependency status and financial information (which requires going out to the IRS.gov website and using a data retrieval tool to pull in details). The app accepts digital signatures. So far, the app is generating mixed reviews. "I am so excited about this app! Very quick and easy to apply! I cannot wait until it is finished and has more features!! It will be a great benefit to students and financial aid professionals!" noted one user. "This mobile app lacks two of the best improvements of the FAFSA over the last decade — renewals, and the IRS Data Retrieval Tool. It is also hard to tell if/when the app is freezing or just taking a moment to process. It's not perfect, but a step in the right direction," reported another. Right now the new app has received a rating of 4.2 out of 5.0 from 23 reviewers on the Apple App Store and 3.5 out of 5.0 from 15 reviewers on the Google Play store.